Street ball was started out of the need to play ball. Many of the inner cities had little to no programs for “street” kids to play sp they took to the streets to show off their skills with a 3v3 style game. 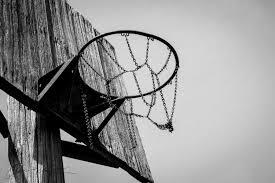 Rules of modern basketball became a bit looser and with any game played on the “street” the courts were less than perfect. 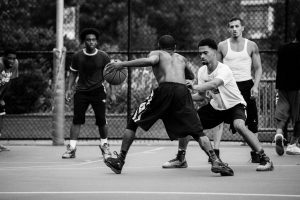 Today “Street Ball” has its own organizations and leagues and can be played just about anywhere. At Work Out West we will have 4 courts to play on. Games are played on traditional half court settings. We will have 2 games going on inside and 2 games in the outside parking lot in front of the tennis center. In traditional fashion, the courts will be rough and rugged just like the sport in its beginning. You will be dealing with flaws in the asphalt which will take your skills to a new level. “Street Ball” makes it a game of learning the court and skills all in one. Games can vary based on weather, climate and the skill of your opponents. We look forward to seeing what everyone brings to the game. 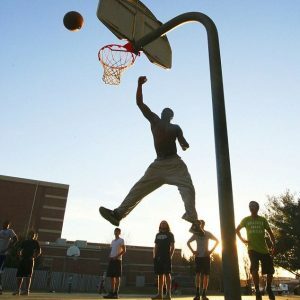 This should be a league that breathes fun and life into the “Street Ball” scene. Each game will be to 15 points or 15 minutes long. Best of 3 games wins. The team must win by only one point. After a basket has been scored or a foul called, a player must put the ball in play from a line past the three-point line above the foul key. All held balls will be put into play behind the three-point line with possession given alternately to each team. On defensive rebounds or steals, players must return the ball by dribble or pass across the three-point line before a basket may be attempted. Once across the line, they do not have to pass the ball before shooting. Street League is a call your own foul league with court supervision. A foul called in the act of shooting will result in either two or three points being awarded to the team which was fouled, depending on where the player was fouled and a change of possession. A non-shooting foul will result in the award of one point to the offended team and the ball back. A foul called in the act of shooting will result in either two or three free throws awarded to the team, which was fouled, depending on where the player was fouled. A non-shooting foul will result in one free throw to the offended team. All free-throws will have players lined up in the lane lines and play live one release. The three-second rule will apply to all offensive players. Substitutions may be made after a basket or an out of bounds play or use of time-out. Each team is only allowed one 30-second timeout per game. If the game ends in a tie after regulation time there will be a 1st to 3 round. Possession will be determined by the home team shooting for ball. 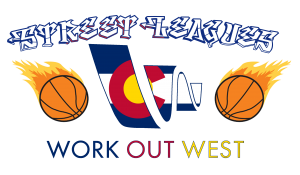 All teams must have a roster form filled out and a waiver for each person on their team on file with Work Out West. We will verify membership status in our system. Any person that is not a member but says they are will be disqualified without refund or may sign up for a membership.